ESET Smart Security (ESS) is a popular all-in-one comprehensive protection package that includes antivirus, antispyware, antispam and personal firewall. ESET Smart Security built on the even popular ESET NOD32 AntiVirus and able to detect and eliminate modern day threats like viruses, keyloggers and spyware. If you’ve taken advantage of previous free license serial key of ESET Smart Security which gives you free user name and password of ESET Smart Security, and the license is about to expire, here’s another way to get free license with genuine working username and password for ESET Smart Security 3.0. Tip: With username and password for ESET Smart Security, owner is entitled to free ESET NOD32 AntiVirus too, so it’s the best of both world. International You are trying to visit ESET UK from United States of America. Are you sure you require the UK Site? Or would you prefer to visit the US website? Click here for a complete list of international ESET sites. Skip all the fields on the online form until “Where did you hear about NOD32?”. Pick any selection for it. 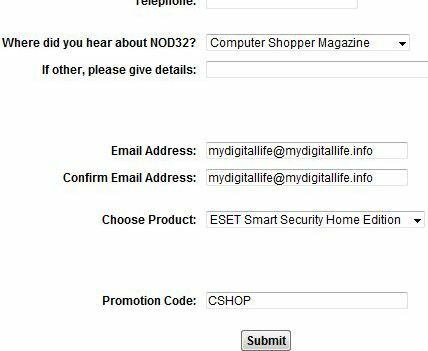 Select ESET Smart Security Home Edition – Home Edition for “Choose Product”. In the text box of “Promotion Code”, enter CSHOP. If it’s not working, try PRO100. A validation email will be sent to your Inbox. Open the email and click on Click here to validate your email address to confirm you are the owner of the email to receive the license key. A genuine working username and password for ESET Smart Security valid for 101 days will be shown on screen. The direct download links to setup installer of ESET Smart Security (current version 3.0.684). You will need to enter the user name and password received to download. Offer expires January 31st, 2009.